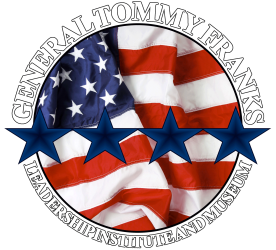 Four Star Leadership with General Tommy Franks is a world-class summer leadership program that allows 50 of the top high school students in the United States to have a face-to-face experience with national and international leaders. Oklahoma Christian University, Oklahoma Business Ethics Consortium & Foundation and the General Tommy Franks Leadership Institute and Museum are co-hosting to create this opportunity for our next generation of leaders. Students are presented with ethical and leadership challenges which they must address individually in a persuasive speech and editorial format, and collaboratively in an Ethics Bowl competition. The program includes team building exercises, spontaneous problem solving and coaching in persuasive speaking and writing. Please RSVP for these special opportunities in correlation with Four Star Leadership by June 30 by making your purchase below or call the General Tommy Franks Leadership Institute and Museum at (580) 726-5900. Events will be held in Oklahoma City including the Four Star Leadership Luncheon at 11:30 am and VIP Dinner Reception at 6:00 pm on July 17 and the breakfast with Four Star General Tommy Franks and Mo Anderson on July 18. • A ticket to the Four Star Leadership Luncheon Banquet featuring Dermot Ahern, former Government Minister of Ireland. The early bird price of $75 is good through July 3. After July 3, tickets are $90 each. You will receive tickets and event details once your registration has been received. donate and impact the future leaders of tomorrow.